You will improve your probability of Project success greatly if you look to identify the Risks for your project and go out and attack the important ones. There are many manuals written on Risk Management so what I intend to do in this post is give a "whistle stop tour" and inspire you to take this seriously in your Projects using a few Proverbs along the way! Firstly a reminder of what a Risk is. A Risk is an event which may happen which can have a negative (or positive) impact on the project in all it's dimensions - Time, Cost, Quality, Benefits etc. Yes you can have Risks with a positive impact - an upside! For example, if your Project is to introduce a new public search engine. If you stated a Risk of Google going out of business, this would have an upside on your Benefit Case for sure. I just don't think the probability would be that high and we will return to that point later. But it raises an interesting point on Risk Identification. We all focus on internal risks but we should try and force our thinking to consider external risks too. Another point you might want to get a sense of early on in the project lifecycle (ideally from the Project Board) is how much risk is acceptable - sometimes a project needs to be very risk adverse, sometimes a more risky, adventurous project is acceptable. 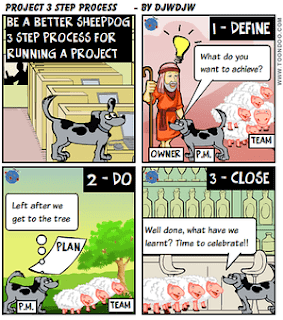 The first point to recognise about Projects is What you don't know ..... hurts you! So use your own judgement and that of the team (brainstorm workshops) on what could trip up successful execution of the plan (mainly) and also consider both internal and external factors. 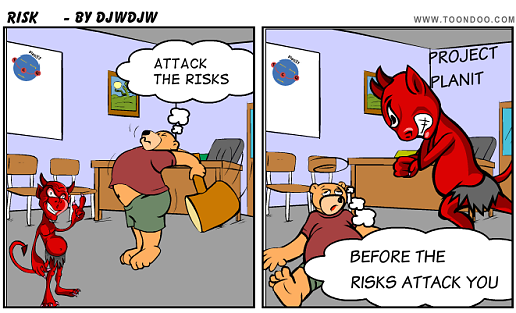 You can always put in some standard risks, here are a couple for your Risk Log - Parkinson and Murphy! use similar style wording "Risk that <something happens> due to <cause> resulting in <effect>"
double check, have you captured both the cause and effect of the risk? Proximity - when is a risk likely to materialise as an issue? Clearly if a risk can't materialise for many months you can focus your immediate attention to those that could hit you next week! What I do in my Excel Risk Log is to apply a simple scoring system 1 for Low, 2 for Medium and 3 for High. I then multiply Probability x Impact to give a Risk Score and sort the resulting log by Score to give a crude list in order of importance to look at. ensure the Risk owners take their role seriously and keep you posted outside any regular meeting. The person should understand that they will be under the spotlight should a risk materialise and questions will be asked! As I said in the introduction, Risk Management is a big topic and this is just a taster to inspire you to take it seriously within your project and not just pay lip service to the topic. So go identify, evaluate and attack the big risks which threaten your project success. Otherwise, there is a fair chance that one of them will come and give you a bloody nose!